I love summer! For the past few years, ours has been full of camps, trips, and holiday celebrations with family. So far this year, we’ve had cheerleading camp, youth camp with our church group, a beach vacation with family mixed with a couple of birthdays and other holiday celebrations. My daughter is spending this week with her best friend who lives in another state and we still have two more birthdays to celebrate. When I look at the calendar marked up with days away from home and the days we are home with their doctor appointments and church activities, I have a choice—embrace or resent. 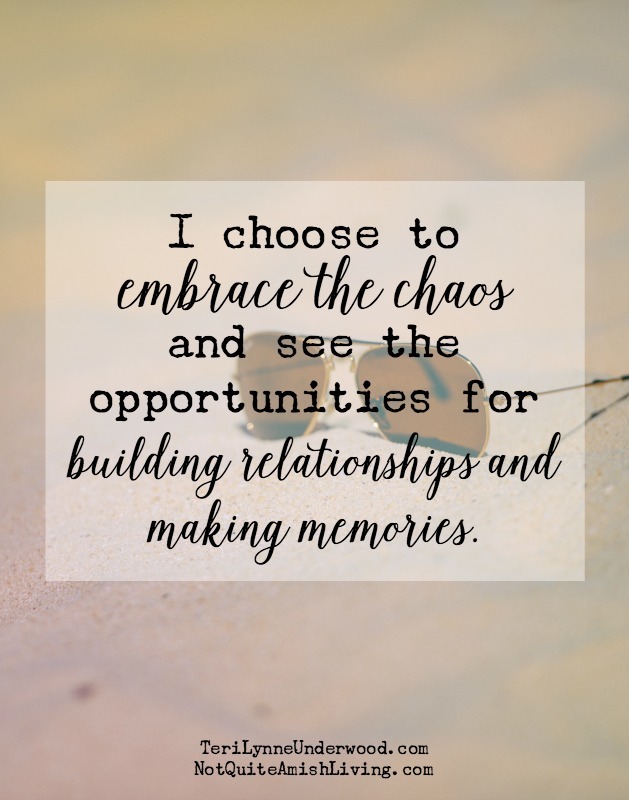 I made the decision in May: I choose to embrace the chaos and see the opportunities for building relationships and making memories. Yes, we’re tired sometimes. Yes, on the days when we have nothing to do I’m likely to stay in my pajamas all day. Yes, we could do less. But this is a season … and all too soon it will pass. My girl is fifteen. Her sophomore year of high school starts in less than one month. In just two summers we’ll be getting senior pictures made and planning college visits. So, we go — to camps and on trips, to see movies and to celebrate birthdays. We’re gone more than we’re home, it’s true. But we’re together. In a few years, our summers will look different. And I have a feeling we’ll miss all this. My choice really wasn’t hard and it has brought me far more joy than I can explain. I’ve learned this: sometimes being busy together is the best place to be! How do you manage the busy seasons in your family’s life?